At the end of Texas’ 31-27 come-from-behind win over Oregon State in the Alamo Bowl, most viewers were left with one questions: What was Mike Riley thinking? Riley, Oregon State’s head coach, refused – almost defiantly – to switch quarterbacks when starter Cody Vaz started to struggle. 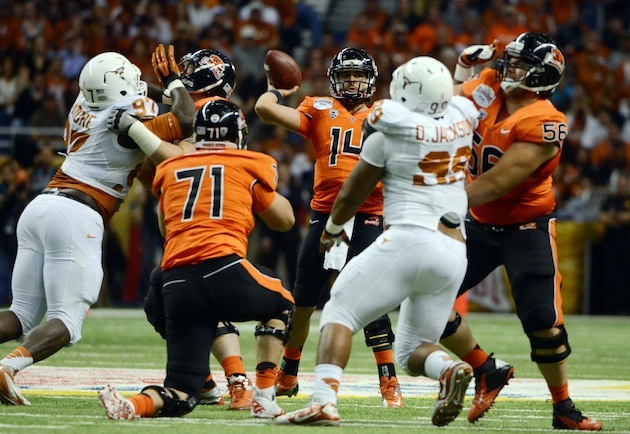 Consequently, Oregon State’s offense sputtered in the second half and Texas took advantage to overcome a 10-point fourth quarter deficit. But before we examine Oregon State’s questionable quarterbacking situation, it’s important to note that Texas’ quarterbacking quandary – something that has been a source of consternation for the Texas faithful for two seasons – seems solved. David Ash was absolutely fantastic, especially in the second half when his team needed him the most. Despite an interception that led to the Beavers’ only second half score, Ash led the Longhorns on two touchdown drives, both of which included plays where he rushed for big yardage and heads-up touchdown passes that led his receivers into the end zone. It was the best Ash has played this season and perhaps the first time he’s really looked like the Texas starter. Perhaps that was because backup Case McCoy, who has been Ash’s nemesis in the quarterback rotation, was sent home Friday because of a violation of team rules. While Ash got the offense going, the Texas defensive line overpowered Oregon State and managed nine sacks, including 4.5 by Alex Okafor, who was playing in his final game as a Longhorn. Oregon State, behind a jittery and indecisive Vaz, had minus-4 yards of offense in the fourth quarter. Ash completed 9-of-11 passes for 146 yards and two scores in the final period. It was the type of game that should give Texas fans hope that their team might be heading back to the prominence it enjoyed up until about three years ago. As for Oregon State, there’s going to be a lot of finger pointing. The Beavers had a chance to win 10 games for the first time since 2006 and seemingly had it wrapped up after the Ash turnover pushed the lead to 10 points - again. But at no point did anyone – even the announcers calling the game – feel like Vaz was the right guy to bring the game home. He completed just 15 of 28 passes for 194 yards and two interceptions. He also had a fumble. But more than that, he was indecisive when the Beavers needed him to be a leader. He held on to the ball too long, which aided Texas in its sack parade. The Oregon State offensive line was beaten up pretty good, but Vaz, who was nursing a bad ankle, was a sitting duck. Meanwhile, Sean Mannion, who started the final game of the regular season, rotted away on the bench. He got in for a couple plays while Vaz had his ankle taped and the Beavers did well. So what was the next step? Pull him. And it wasn’t like Bad Vaz showed up late in the game when it was too late to make a change. He had an interception and a fumble early and never looked comfortable. Oregon State’s running game, led by 118 yards and two touchdowns by Storm Woods, was the reason the Beavers were in the game. This game isn’t necessarily being pinned on Vaz, it’s on Riley, who up until Saturday night had been lauded for the nation’s best turnaround. However, today’s coaching looked a lot like the Riley that went 3-9 a year ago. Got a tip for Dr. Saturday? Email us at dr.saturday@ymail.com. You can also connect with us via Twitter @YahooDrSaturday and be sure to "Like" Dr. Saturday on Facebook for football conversations and stuff you won't see on the blog.